Western blot analysis of extracts from A549 and PC-3 cells, mock transfected (-) or transfected with ALKBH3 siRNA (+), using ALKBH3 (E6S4R) Rabbit mAb (upper) or β-Actin (D6A8) Rabbit mAb #8457 (lower). 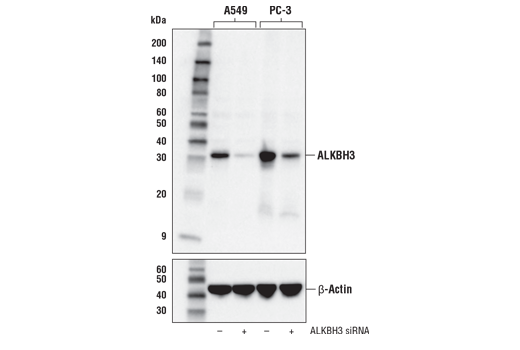 ALKBH3 (E6S4R) Rabbit mAb recognizes endogenous levels of total ALKBH3 protein. Monoclonal antibody is produced by immunizing animals with a synthetic peptide corresponding to residues surrounding Val10 of human ALKBH3 protein. ALKBH3, also known as Prostate Cancer Antigen-1 (PCA-1), is a DNA and RNA demethylase involved in the repair of alkylated DNA. The protein is overexpressed in prostate cancer and has been linked to other cancer types, including non-small cell lung cancer, renal cell carcinoma, and pancreatic carcinoma (1-3). ALKBH3/PCA-1 is also a potential therapeutic target in prostate cancer (4). Hotta, K. et al. (2015) Oncol Rep 34, 648-54. Yamato, I. et al. (2012) Cancer Res 72, 4829-39. Konishi, N. et al. (2005) Clin Cancer Res 11, 5090-7. Nakao, S. et al. (2014) Bioorg Med Chem Lett 24, 1071-4.